As a brand, we pride ourselves in having the maximum number of certifications in the winding wire category. Both process and product certifications as per Indian as well as international standards have been awarded to us. It is for these certifications and our stringent quality control internal processes that our products are endorsed as the benchmark of quality by the electrical industry. 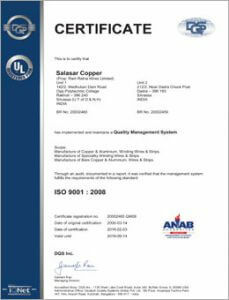 Both our manufacturing units are ISO 9001 : 2008 certified. The certification was awarded to us in the year 2014. For the international standards, we have been awarded with BS OHSAS 18001:2007 certification. 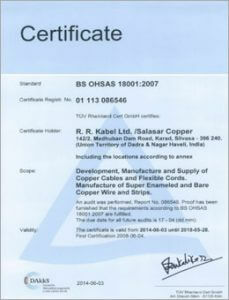 The certificates were awarded to us in the year 2007. We are the leading manufacturer and supplier of quality winding wires in the electrical equipment industry. Our products are utilized in various equipment including transformers, cables, transmission lines, switchgear, capacitors etc. Our success lies in our continuous commitment in providing quality products, emphasis on technology and customer-centric approach in delivering the finest products year after year for five decades. Our belief in these values has not only made us the leader but also an "industry standard" for winding wires. Our future plans include to further expand our business in global markets with the same commitment and passion. Copyright © 2017 RR Global | All rights reserved.